Pow! Ooph! Wow! 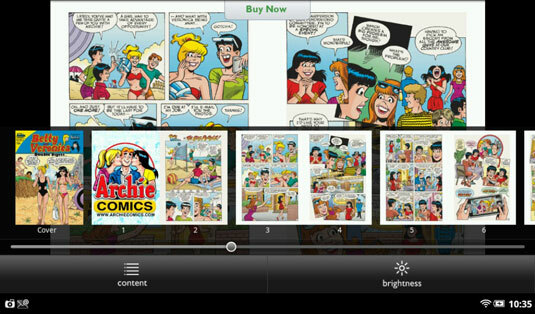 The NOOK Tablet can display specially formatted NOOK Comics books in portrait mode or landscape mode. Moving within a NOOK Comics book is very similar to the steps involved in navigating NOOK Kids titles. To zoom in on text and images, double-tap or use the pinch-out gesture. Double-tap again to return the page to normal. Bookmark a page by tapping the icon in the upper right. Once you place a marker, tap the center of the page to display reader tools, tap the Content icon, and then tap the Bookmarks tab. Betty and Veronica never looked so good as they do in NOOK comics.